Not My Master hail from El Paso, TX and play what they have dubbed “Texas Metal”. An unholy alliance of the best traits from Celtic Frost (or even Hellhammer) and Pantera, the band excels in extreme metal. The band features Chris Kidwell on vocals, Chelo Styles on guitar, Rudy Barajas on bass, and Charlie Gonzalez on drums. The band has played festivals and shows throughout Texas, honing their live show – culminating in a highly desired date in March opening up for Vince Neil (Motley Crüe). What I love about Not My Master – and you might too – is that the band navigates melody and aggression in equal measures. Not unlike Metallica’s misunderstood masterpiece, St. Anger (yes, I’m serious). Thrash, melody, and catharsis comfortably co-exist here. Disobey is the band’s first release. It is a statement of intent – as an EP, it hints at greatness. The future is bright for Not My Master. Acadence sets the tone for the release – sludgy guitars that would sound out-of-place in Seattle, military drums, and barked / howling vocals. It pummels and delights. Where’s God Now is slightly less aggressive but no less dark in tone. Lyrically, the band is on fire “angry voices / mindless choices” culminating in a question that has haunted mankind forever. It’s a an insight into darkness and musically thrilling. Morning Star starts off as the least aggressive tune thus far before exploding in a noisy maelstrom. How the Gods Kill is a cover of the famous Danzig tune. It is a nice moment of familiarity – a nod to influences as well as a showcase for Chris Kidwell’s vocal chops. It is a highlight on an EP full of them. In fact, Glenn Danzig’s words can kind of sum up the feel of the EP “If you feel alive / In a darkened room / Do you know the name / Of your solitude”. You can follow the band on the Social Network and get the latest happenings here. 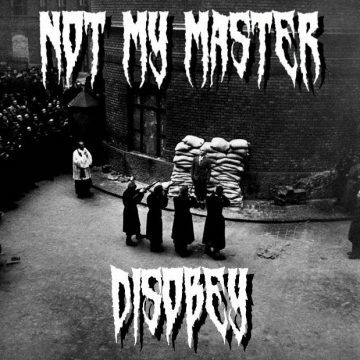 Not My Master is an exciting new metal band that is worthy of your time and attention.